Brooks Bennett, a Nashville native and Belmont musical theatre freshman grabs the microphone and booms through the Troutt Theatre’s sound system—“10 to places!” (In everyday speak, this means that actors, dancers and stage hands should take their places in 10 minutes…dress rehearsal is about to begin.) The student sitting a few rows back in the audience shouts, “Thank you, 10!”—a designation given to acknowledge the time stamp was heard. Back stage, energy is high. The principal actors arrived hours before call and have spent the last 90 minutes curling every hair on their head, applying just the right amount of blue eye shadow (after all, Doralee Rhodes has a reputation to uphold), getting fitted for microphones, making last minute costume adjustments with the show’s professional costumer and slipping into the green room’s bathroom for one last vocal warm-up. Between mascara application, costume stitching and sips of vocal coat tea (a trick one of the lead actresses swears by), conversation flows. MT students Mary Kate Hughes, Cassie Donegan and Lizzie Hinton (L to R) play Violet Newstead, Doralee Rhodes and Judy Bernly. With dancers running between floors and hairspray so strong you can taste it, Belmont’s musical theatre department is in their final preparations for “9 to 5,” their 2017 spring musical. Set in 1979, the storyline follows the lives of three women who work together at Consolidated, Inc. Overworked, underpaid and fed up with workplace inequality, Violet Newstead partners with co-workers DoraLee Rhodes and Judy Bernly—and they get even. In what Director and Assistant Professor of Musical Theatre David Shamburger calls a redemptive story, the trio ultimately learns that what they’ve been looking for was inside them all along—even the strength to fight their “sexist, egotistical, lying, hypocritical, bigot” of a boss. 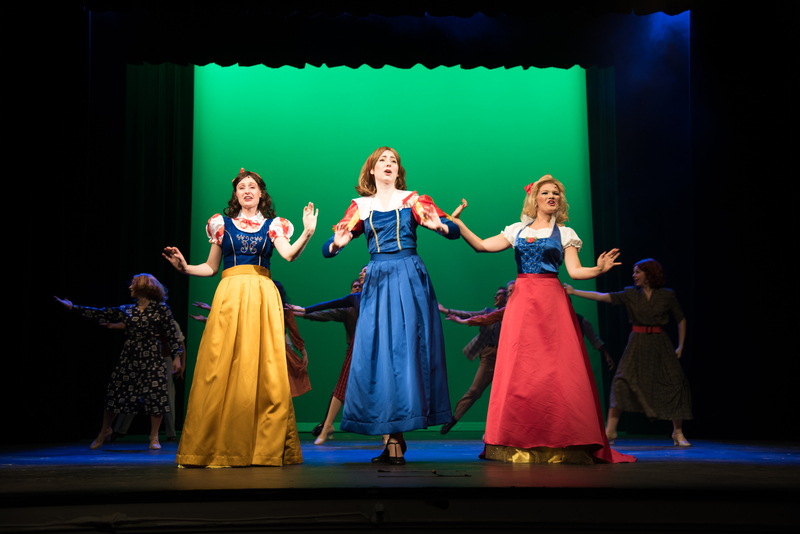 The show was cast before the semester ended in December for the holiday break, and students are expected to return to campus with their lines and lyrics memorized. Jumping straight into daily rehearsal, the process is underway. Run like the ‘real world,’ students who enter the musical theatre program are preparing for careers as professional performers from day 1. Coordinator of Musical Theatre and Professor Nancy Allen said the department prides itself on the way students are conditioned for professional theatre. From behavior to preparation to the routines of each rehearsal, students who graduate from Belmont understand what to expect in a professional troupe. List on stage as Roz during “Heart to Hart,” a musical number during the show. Sitting in the audience during dress rehearsal, Shamburger (“Sham” for short) echoes this feeling. His voice can be heard through each act as he gives notes to the rest of his technical team—that reaction should be larger, she should enter just a bit sooner, someone forgot Judy’s desk…who is assigned to Judy’s desk? Don’t get in the way of the Skrim! His notes may sound expected as he comments on the delivery of each line ensuring the right inflection, timing and diction, but his motivation is what makes his style unique. Doralee (Donegan) takes notes from her boss, Franklin Hart. The final note rings out and cries of applause fill the theatre, despite the small crowd that’s watching (primarily made up of the other cast—students who will take the stage tomorrow night). The cast completes a full curtain call as they practice taking their bows, motioning towards the orchestra and acknowledging their tech team before Sham calls from the back of the theatre and asks the group to be seated. She closes in prayer—thanking God for her students, her colleagues and the ability to tell the “9 to 5” story. “See you tomorrow,” she says. The cast begins to trickle from the stage, wipe off their make-up and remove their wigs. They’re out of costume and back to their own lives as students—at least until class tomorrow. With two days left until the show’s opening night, it’s go time…especially between the hours of 9 to 5. Belmont’s production of “9 to 5” can be seen in the Troutt Theatre on Thursday, March 30 at 7:30 p.m., Friday, March 31 at 7:30 p.m. and Saturday, April 1 at 2 and 7:30 p.m. Tickets can be purchased here.